What can you do with data? 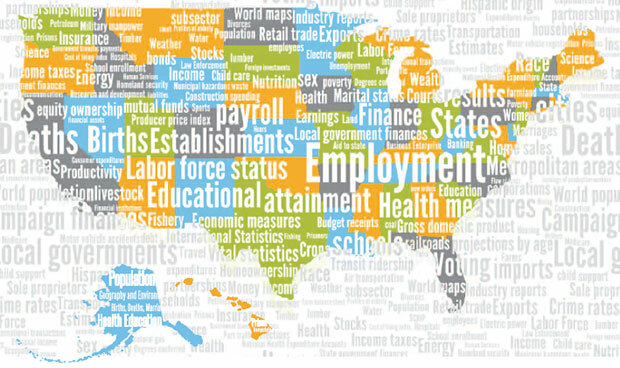 Find sources for statistics and datasets by subject and geographic area. Let us know if you know of others and we'll add them to this list! Millions of open datasets -- search, distribute, visualize, and collaborate. A portal to four mega-websites.The data can be used for econometric methods or analogous situations, or to adjust data such as accounting for inflation or population. Maps, Reports, Statistics, and raw data from the World Health Organization. Use the dedicated box to search and explore public datasets. In order to contribute to the broader research community, Google periodically releases data of interest to researchers in a wide range of computer science disciplines. The best place to discover and seamlessly analyze open data. The UCI Machine Learning Repository is a collection of databases, domain theories, and data generators that are used by the machine learning community for the empirical analysis of machine learning algorithms. Miscellaneous datasets and descriptions from the Statistics Department at the University of Florida. OSTI makes available decades of research and data. Search for 'DOE open data' and refine with the 'Data' limiter. Search or browse free and open access to global development data. The Bureau of Labor Statistics is the principal agency for the federal government in the broad field of labor, economics, and statistics. Includes maps, statistics, photos, topical overviews, and country comparisons. Consumer Price Index, Employment / Unemployment, Income and expenditure, Injuries at work, International labour migration, Labour costs, Strikes, and Wages. This portal from the St. Louis Federal Reserve Library simplifies the search for world-wide economic indicators. Statistics and reports from 188 participating countries working to foster global monetary cooperation, secure financial stability, facilitate international trade, promote high employment and sustainable economic growth, and reduce poverty around the world. Information on county population estimates, migration profiles, and other census data. Quick, easy access to facts about people, business, and geography from the U.S. Census Bureau. International organization that promotes policies to improve the economic and social well-being of people around the world. Focuses public attention on economic mobility---the ability to move up or down the income ladder within a lifetime, or from one generation to the next. Nonpartisan presentation of the facts, figures, and trends in mobility. Uses MICS to assess the situation of children and women in the areas of mortality, education, health, gender equality, rights, and protection.